By all 9 of my candidates, after an action packed and for the participants, a nerve wrecking weekend. 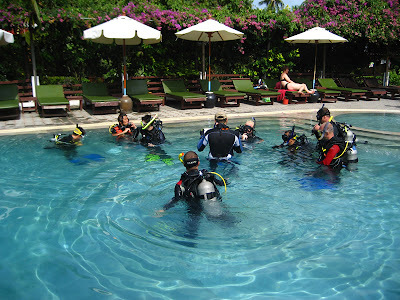 Under the skillful guidance of George Wegmann, the PADI examiner, who's send over by PADI HQ to evaluate the candidates, all 4 segments of the PADI IE were absolved and completed. Here's George giving a briefing for the Confined Water part of the IE. Simon, James, Marcus, Fred and IDCS Paul are listening in. All 9 of them and George together in the pool for their Confined Water skill circuit. After having completed all 4 segments of the IE, Theory (5 Theory Exams and a General Standards exam), Confined Water, Open Water and Knowledge Development, the tension is gone and their listening to George's debriefing at the end of the IE. 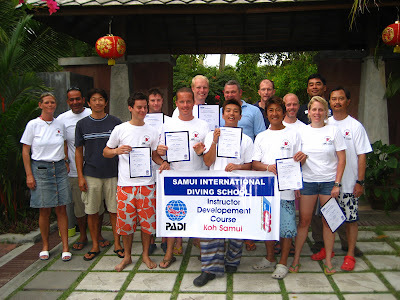 From left to right Chris and Wahid Azab (IDCS), Nobuhiko Abe (IDCS), Adam Tomaszweski (OWSI), James Donald (OWSI), Gideon Rybier (OWSI), Simon Brindley (OWSI), Satoshi Kajiyama (OWSI), Paul Meredith (IDCS), Camille Lemmens (CD), Atsushi Imanishi (OWSI), Fred Wynn (OWSI), Ulrike Dennacher (OWSI), George Wegmann (PADI Examiner) and Marcus Han (OWSI). Akira Sakuyawa (IDCS) is missing in the picture. Gideon has more info on his blog. Well done and good luck to you all!